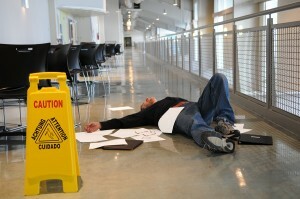 If you have suffered a slip and fall injury, you need an aggressive lawyer with premises liability experience. Top attorneys with our practice have received numerous accolades. Our Avvo reviews place us among the best injury law firms in Riverside County. As honest lawyers, the fees for our award-winning law firm are on a contingency basis, meaning you only pay if we win. In the Inland Empire region and throughout our state, California law requires a property be maintained in an effort to be safe and free of any hazards. If you are injured on someone else’s property by tripping or slipping and falling, you are allowed under the law to receive complete compensation for any current and future medical care, lost income, and your other injury-related expenses and costs. In addition, you will need the representation of a qualified personal injury attorney. If you have suffered an injury in Southern California as a result of a slip-and-fall or trip-and-fall incident, speak with Purcell Law at once and speak with experienced Riverside slip and fall injury attorney Chris Purcell. Obviously, some of these injuries are much more serious than others. Bruises, cuts or scrapes may not do much damage or alter the way you live, but a spinal cord injury certainly will. These injuries, along with those to the brain, are among the most serious injuries you can incur and may affect the quality of your life. If you have been injured in a slip and fall accident, contact an experienced Riverside slip and fall attorney immediately following the accident. You will only have two years after the date of the accident to file a claim against the property owner, so it’s imperative that you move quickly and speak with attorney Chris Purcell as soon as possible. The defendant owned, leased, occupied or controlled the property at the time of the victim’s injury. The defendant acted negligently in the use or maintenance of the property. The plaintiff was injured as a direct result of the slip and fall accident. Negligence must be proven in order to receive compensation in a slip and fall case. Therefore, the more evidence you have to prove negligence, the better. Take photographs of the scene of the accident, and if there were witnesses present, always get their contact information so your attorney can get in touch with them later. Ask the owner of the store or property if there are any security cameras and if so, see if you can get a copy. If he or she refuses to hand them over, let your attorney handle the situation. Remember, your health should be your first priority after a slip and fall accident. Always seek medical attention if you have been injured and make sure you keep any documentation related to your injury. This will help you in your efforts to receive compensation for your medical expenses, lost wages, lost earning capacity and pain and suffering. If you have been injured in a slip and fall accident, reach out to attorney Chris Purcell immediately.Property owners may try to place the blame on you, so it is imperative that you work with an experienced slip and fall attorney. Schedule a free legal consultation today. If you are injured slipping or tripping on stairs that have no railings, you can probably pursue a premises liability lawsuit based on a building code violation. Property owners may also be held accountable for an injury if they create a hazard that causes an injury or if they are aware of a hazard but neglect to repair it. When you slip or trip and become injured, experienced attorney Chris Purcell can quickly begin investigating the accident, gathering the evidence, and examining the witnesses on your behalf. Let Chris handle your slip-and-fall injury claim and the negotiations for your compensation. If a negotiated settlement cannot be reached, Chris Purcell will take your injury claim to a jury of your peers, and he will ask that jury to award you the maximum possible compensation. If you’ve been severely injured or permanently disabled, you’ll need that maximum amount, and you can trust attorney Chris Purcell to fight aggressively for the compensation and justice you deserve. When you’ve been suddenly and unexpectedly injured because someone else was negligent, you’ll need a lawyer who provides the legal advice you need and is catered to your individual legal needs and circumstances. Attorney Chris Purcell represents slip-and-fall injury victims who want to seek justice in Riverside, San Bernardino, across the Inland Empire region, and throughout southern California. He has experience representing people in cases involving slip and fall accidents, motorcycle accidents, dog bites, pedestrian accidents, construction accidents, defective products, and motor vehicle accidents. Chris handles all premises liability and personal injury claims on a contingency fee basis, so clients of Purcell Law pay no fees unless and until Chris Purcell recovers compensation on your behalf. If you’ve been injured because of negligence in southern California, make the call now. Nothing is more important than your health and your future. To schedule a free consultation with Riverside slip and fall lawyer Chris Purcell, please call our offices at 714-332-5098, or contact Purcell Law by email.